For many people, Johnny Ball's TV programmes were the first indication that mathematics does not have to be frightening or hard work, but could actually be fun. In the introduction to Wonders Beyond Numbers, Ball mentions being particularly inspired by Martin Gardner's books of mathematical puzzles and diversions - as were so many - and Ball's TV programmes had a similar inspirational effect, particularly for younger viewers. In this chunky (480 page) book, Ball takes on 'a brief history of all things mathematical.' In doing so, he gives us a broad sweep, making things more interesting than would be possible if concentrating purely on the work of mathematicians. So, for example, in starting with the Ancient Greeks, he brings in philosophers who had little direct input to maths, but who helped produce the thought processes that would inspire the big numerical names. Towards the end of the book, there are a good number of physicists brought in who, again, didn't contribute much to mathematics (it's hard to think of less mathematical physicist, for example, than Faraday), but who were contributing to a discipline where maths has become absolutely central. Wisely, Ball drives the narrative from the people, rather than taking us through a whole list of mathematical disciplines and components. It's not that the branches of mathematics aren't there. We get plenty of geometry, for example, and algebra, number theory, calculus... the works, all the way up to topology and other trendy topics. But it never feels like we're reading a watered-down textbook. The relationship between human beings and mathematics always prevails. It's often the case with books of this kind that the focus is entirely on Europe, but Ball gives us a satisfying couple of chapters that take in China, India, Central America and the Arabic-speaking world. If anything, this was the best part of the book for me, as it covered material that is less frequently seen and is a real eye-opener. I also particularly liked the section at the back labelled 'Wow Factor Mathematical Index' which is really more of an appendix, diving into the actual mathematical bits in more detail for those who feel up to it. Here we discover everything from the way that the Ancient Egyptians did division, through a calculation to estimate the length of Archimedes' 'lever to move the Earth', to Al-Khwarizmi's algebra. It was sensible to separate this material off, as it's significantly more detailed than is the rest of the book, but satisfying to have it if required. 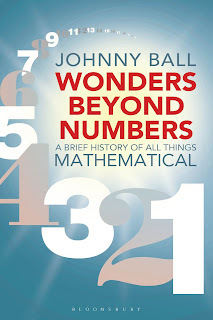 Wonders Beyond Numbers delivers a whole lot of maths, mathematical history and biography - if I've a criticism it fits too much in, which means that many of the individual biographical sections are more summary than I would have liked. The result is a book that isn't ideal to sit and read end to end. I found it better to dip into on a regular basis - great for commuting or bedtime reads. The speed of coverage meant also that some of the history was a little over-simplified. For example, we are told that the idea the Earth was cylindrical 'remained unchanged for some 700 years'. Yet many philosophers in that period from Aristotle to Eratosthenes (who assumed a spherical Earth in his calculation of its size) considered it a sphere. If maths has always seemed little more than arithmetic, or you can't see the point of algebra, or it all seems a set of rules handed down from on high at school, without any context of where these ideas came from, this is great book to start making sense of this most remarkable of disciplines. Thanks for your appreciation. It's quite simple - the only funding this site gets is from Amazon affiliate links. There is no real alternative at the moment.